Prototypes of the MIT Seaswarm robots have been tested in the ocean, but they're not ready for commercial use. (CNN) -- Here's a new way of looking at oil spill clean-up: Forget the big ships, massive work crews and hefty price tags. Instead, just deploy an army of autonomous, oil-scrubbing robots. They can find the oil on their own. And when they reach the site of an oil spill, they talk to their robot friends to figure out the best way to get the whole thing mopped up. That's the vision the Massachusetts Institute of Technology put forward on Wednesday as the school announced the development of a prototypical robot called Seaswarm. The $20,000 robots will be unveiled officially to the public on Saturday at an event in Venice, Italy, and will be ready to deal with oil spills in about a year, said Assaf Biderman, who oversaw MIT's research team on the project. The Seaswarm robots, which were developed by a team from MIT's SENSEable City Lab, look like a treadmill conveyor belt that's been attached to an ice cooler. The conveyor belt piece of the system floats on the surface of the ocean. As it turns, the belt propels the robot forward and lifts oil off the water with the help of a nanomaterial that's engineered to attract oil and repel water. "You can imagine it like a carpet rolling on the surface of the water," said Biderman, who also is associate director of the SENSEable City Lab. The material on the robot's conveyer belt, which MIT calls a "paper towel for oil spills," can absorb up to 20 times its weight in oil. Once it has absorbed the crude from the surface of the ocean, the robot can either burn off the oil on the spot, using a heater on the "ice cooler" part of its body, or it can bag the oil and leave it on the surface of the water for a later pick-up, Biderman said. That oil could be reused or recycled. The robots are designed to work in a swarm, he said, meaning thousands could be deployed on the same spill at once. They coordinate with each other by using GPS location data. That lets them plot out the most efficient way to tackle a clean-up project. Biderman said the Seaswarm robots are relatively cheap, quick and effective at cleaning up oil spills. Had they been deployed on the Deepwater Horizon oil disaster, he said, the Seaswarm robots would have cleaned up the oil in two months at a cost of $100 million to $200 million, far less than the actual clean-up bill. 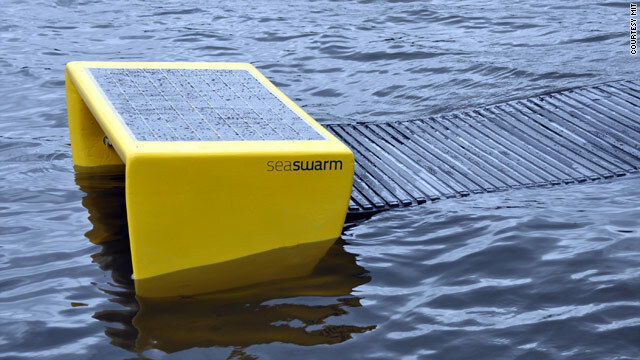 The Seaswarm robots operate on solar energy and require only 100 watts of power, or about that of a bright light bulb. They could stay at sea for months, Biderman said, and could operate around the clock. The conveyor belts on the robots also are engineered in a way that they hug the water to prevent them from flipping over. "Because it adheres to the surface of the water, it cannot capsize," he said, "So it can withstand quite severe weather. Imagine this like a leaf that lands on the surface of the water and moves with the waves and the currents and cannot be flipped over." Traditional oil skimmers are attached to large boats. They must be operated by people, which increases their cost and they are hampered by severe weather. About 800 skimming boats were deployed in response to the Deepwater Horizon oil disaster, which began in April and led to nearly 5 million barrels of oil being released into the ocean, according to government estimates. By comparison, 5,000 to 10,000 of MIT's autonomous robots would have been needed to respond to the spill, Biderman said. MIT will continue research on the robots for about a year, he said, at which time the robot technology would be ready for commercial production and possibly a buyer. Other groups are developing oil-spill cleanup technology, too. Case Western Reserve University has developed another nanotechnology "sponge" material that could be used in response to such disasters. And a company called Extreme Spill Technology says on its website that it has developed a traditional, boat-based skimming technology that works much more quickly and in rougher waters than the traditional skimmers. Biderman said MIT's oil-sopping robot would be most effective in situations like the recent oil disaster, where oil is spread out. "Ideally, when spillage happens, the best thing to do is to contain it right where the spillage occurs," he said. "But quite often the oil goes out of containment, and this is where this technology would be most effective." But the robots were actually designed with smaller, localized clean-ups in mind, he said. "We're hoping that spillage like what we've seen with Deepwater Horizon will not occur again, but oil leakage constantly happens and that's really what motivated us," he said. "When you drill offshore, you always have leakage. And you can imagine a team of robots waiting around the corner for a spill."